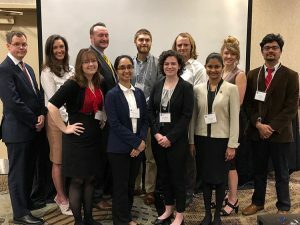 Obaida Shammama, winner of the Three Minute Thesis (3MTTM) competition at the University of Mississippi, recently represented UM at the Conference of Southern Graduate Schools Annual Meeting, held in Knoxville, TN. She is a doctoral candidate in the Department of Political Science. I asked her a few questions about her thesis and the 3MT competition. Obaida Shammama: “When we come across the word Revolution, it often stirs in us images of bloodshed and armed conflict. But unarmed uprisings have surprisingly become more common in recent decades, when trade liberalization was also showing an upward trend. I have a background in economics, and so I was interested to examine the role of international trade in facilitating the onset of major nonviolent resistance campaigns.